Some of you asked about the material I was using to embroider on a linen t-shirt. The answer, of course, is Sulky Sticky Fabri-Solvy. I stumbled on it while cruising the Internet, and this site convinced me to try it. You can easily trace onto it with a permanent marker. 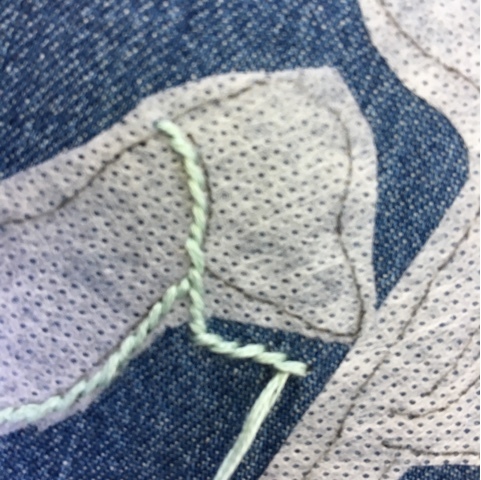 Then you peel off the backing and you have a sticker that goes right on your fabric. It's very easy to sew through. 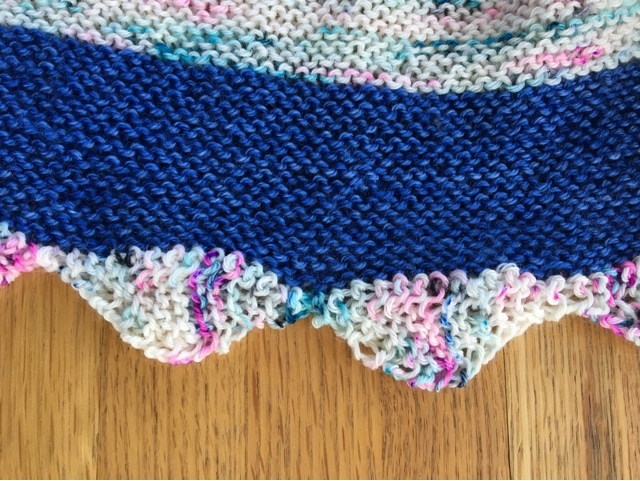 You wash it off by swishing it around in warm water (thus, not so good for wool thread). It takes some work to get all the Fabri-Solvy out, but it does come out. In fact, the linen T is hanging in the basement, drying after I swished it for a while. 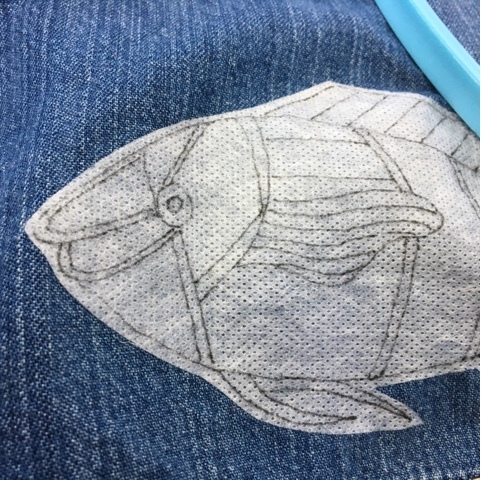 As you can see, I am already working on the next project: a stylized ocean on a sleeveless denim dress. 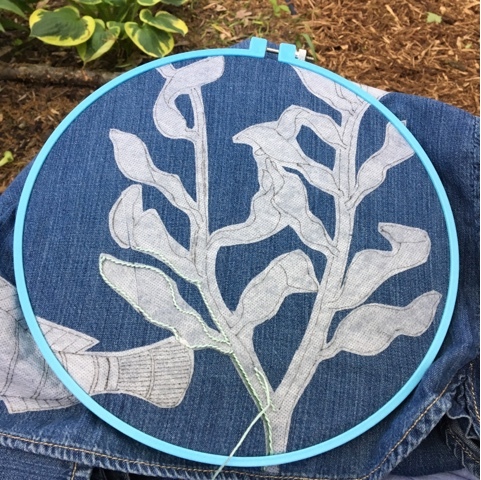 The kelp "sticker" was large and a bit hard to handle, but I got it on where I wanted it. Hope your long weekend is nothing but fun! I've finally gotten serious about the second Idlewild sock. These are very stretchy socks, so if you make them, cast on fewer than you normally would. I'm almost done with This Close to Happy, and I have to say that it is a disappointment. The subtitle calls it a "reckoning with depression," which it is not. The book is more a memoir than an examination of depression. Up next, I think, is The Lonely City, which is a book of essays. I know that some of you are already suffering in the summer heat. Steph is probably jealous that I'm sipping hot herbal tea, wrapped in a sweater, and wearing fingerless mitts. 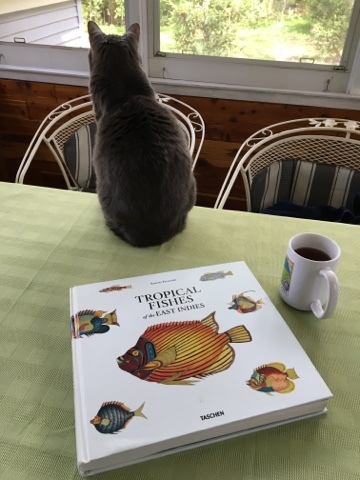 But it is cold and rainy here, and I am more than ready for a bit of summer! I'm not a fan of coloring, but I picked up this book on clearance because I thought it would be good for embroidery. 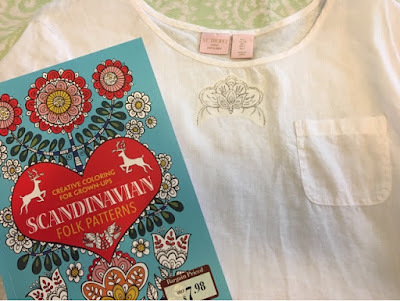 The linen t-shirt is a cheapy from TJ Maxx. I'm going to do it in blues to match a particular skirt. I just hope it gets warm enough to wear a t-shirt here soon! It is well on its way to becoming a Derain scarf. I finished The Signature of All Things, and I have to admit that it gets really slow after page 300, and I skimmed the rest of the book. Where have all the editors gone? And I've just started This Close to Happy, writer Daphne Merkin's account of her struggles with depression. It got very good reviews, so I'm hopeful that it will be interesting. 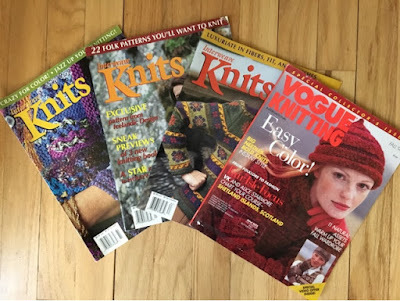 I'm joining with Unraveled today -- and you might want to, too! Whether you are a traditional mother and/or a woman who has nurtured others, I hope you are having a wonderful day. I started mine by working on The Fair Isle Tassel Hat. A baby project just seemed appropriate. Although I'm simplifying much of the color work, I did have to figure out how to use three colors in one row, a new skill for me. It is a beautiful day here, so I'm off for a little walk and then on to my parents' place for brunch. 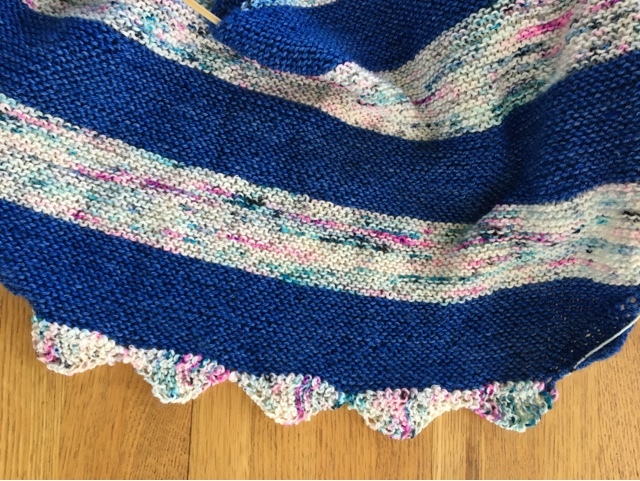 The Summer Camp shawl is almost done. At first the scallops on the edging seemed confusing, but I'm starting to see the logic in the pattern. It's quite clever. I have to confess that I never got this pattern into Ravelry. What I can tell you is that the blue yarn came from Sun Valley and the speckled yarn is a Hedgehog Fibre variety. Both are luscious! 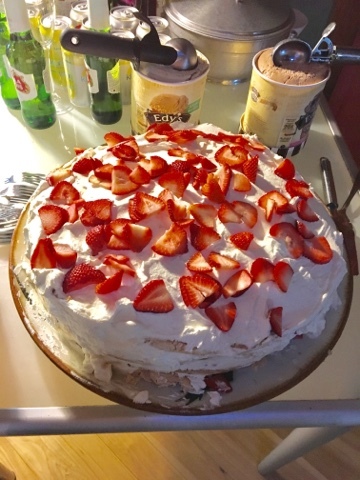 I would consider making another one of these. While it was designed as an easy summer project, it also worked well as a winter project for a bone-tired teacher! I'm very happy to be joining with Kat for Unraveled Wednesday. 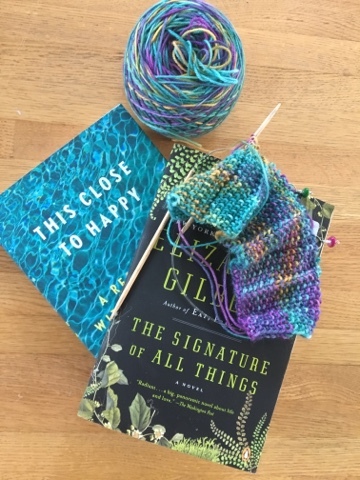 She has picked up where Ginny left off with a Wednesday link party for those of us who knit and read. Thank you, Kat! As it happens, I am home today, nursing a sore neck, and will head out later to see my doctor. My neck has been bothering me since I fell at work a couple months ago. I'm pretty stoic about pain, but this just isn't going away! I'm thinking maybe some PT would help. I'm hoping to finish my Summer Camp shawl. I'm working on those scallops you see along the edge. They'll be a bit of challenge on pain meds. 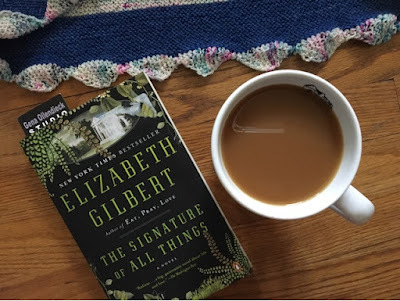 I'm slowly working my way through Elizabeth Gilbert's mammoth novel The Signature of All Things. I refused to read Eat, Pray, Love because it sounds so self-indulgent, and I had my doubts that the author of that book could write a serious novel. But I have a new embroidery project going that related to botany in the 19th century, which is the setting for this book, so I found a used copy and started reading. Many readers on Amazon complained that there is no plot, another reason I was reluctant to read this book. But I'm not sure it needs one. The writing is truly gorgeous, and the main character is someone I want to spend time with. We'll have to see if I'm still hooked through all 528 pages. Can't wait to see you Unraveled! Spring is here in it's green glory! I could hardly wait to come home Friday afternoon and weed. It's been cold and rainy this spring, so this was my first time out in our yard. It felt good to be doing something outside. 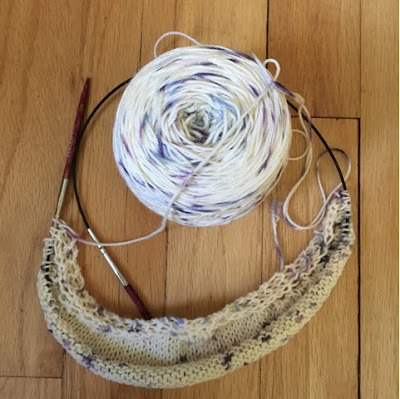 When I came home, I cast on for Helen Stewart's Spindrift Shawl. It's a really relaxing knit, perfect for listening to audiobooks or streaming your favorite show or movie. 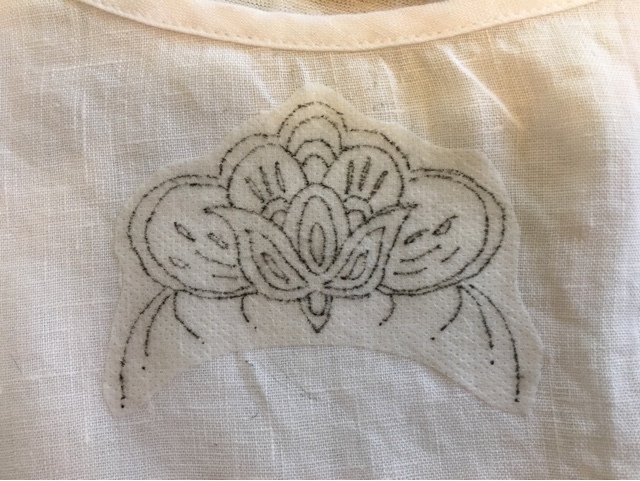 I came home and started working on a new embroidery project. Naji is enjoying our screened porch as much as I am. 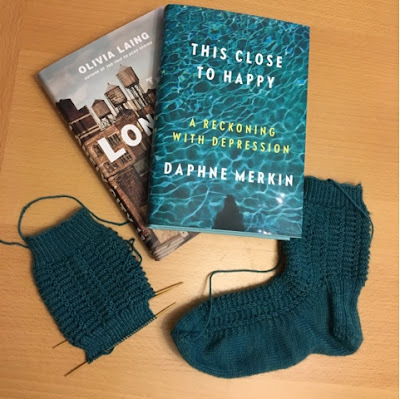 I can't stop thinking of Wednesday as the day to blog about books and needles, so here's what I'm up to. 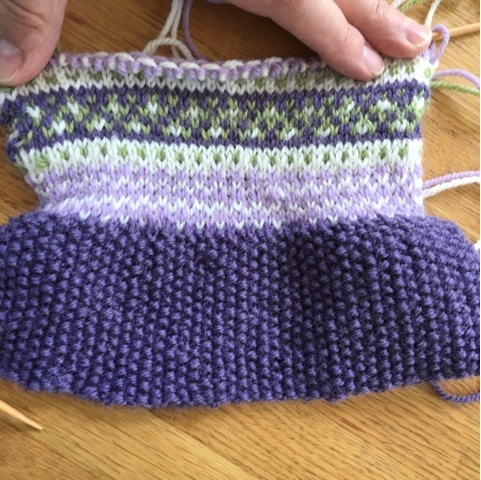 I've started the Fair Isle on the baby hat, but I am simplifying the pattern so there are only two colors per row. It doesn't look lime much, yet. And I've jumped on the Hygge bandwagon, which I first learned about from Kathy. 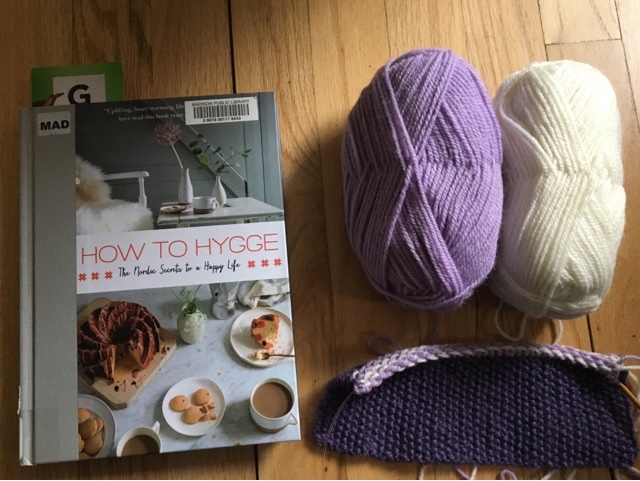 I'm especially interested in Hygge because I'm going to Copenhagen in June. Believe it or not, my round-trip ticket cost $422. Obviously I bought it immediately. I was happy to go alone, but two friends are joining me. It gives me something to look forward to in these last six weeks of school.